Blue Hills Reservation - Canton, Milton, Randolph & Quincy, MA - Take a day trip! Blue Hills Reservation is a huge park that is south of Boston and parallels Route 128 for most of it’s southern stretch where it is marked as Interstate 93. There are activities for just about everyone there and lots of space to spread out in one of the largest tracts of green open space inside a metropolitan area in the United States! With Blue Hills being such a large park with so many different areas and things to do I don’t think it can be covered like other smaller parks I’ve profiled in this site. I decided to break it down by the activities available at each major parking/activity area. There are several great features that can be enjoyed throughout the park including the park’s marquee trail. The Skyline trail is marked by blue rectangular blazes and runs the entire length of the park and has great views from many of the hills that it summits. It is a great hike either in sections or, if you have the better part of a day and are feeling ambitious, you can do the whole thing. It’s 9 miles long and would take at least 4 hours to hike (probably more) and is also easily enjoyed in sections since it touches most sections of the park. What to do here (by section): I’m dividing the available activities up by where you would park to access them. Major parking areas including the Trailside Museum, Park Headquarters/Hougton’s Pond, Ponkapoag Pond, Route 28, The Shea Ice Rink/Quincy Quarries and Chickatawbut Hill. All of these areas include access to park of the reservation’s 125+ miles of trails for those of you who want to hike and bike. Hiking: Some great hikes from here include heading up Great Blue Hill either up the red dot trail or my walking right up the ski slope. 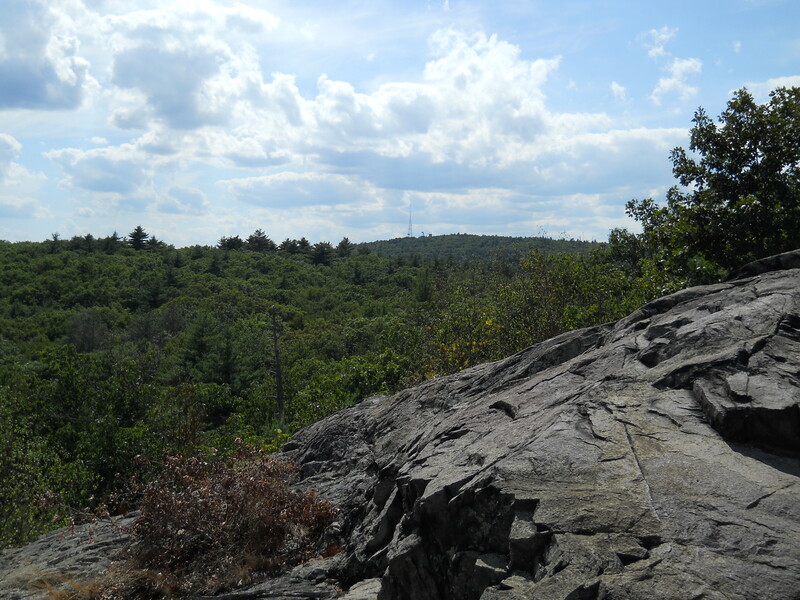 Great Blue Hill, at 635 feet high, is the highest point in the reservation and in Eastern Massachusetts. You can also hike up Little Blue Hill from here as well. Mountain Biking: There are several trails that bisect that park that start here and are suitable for bikes. 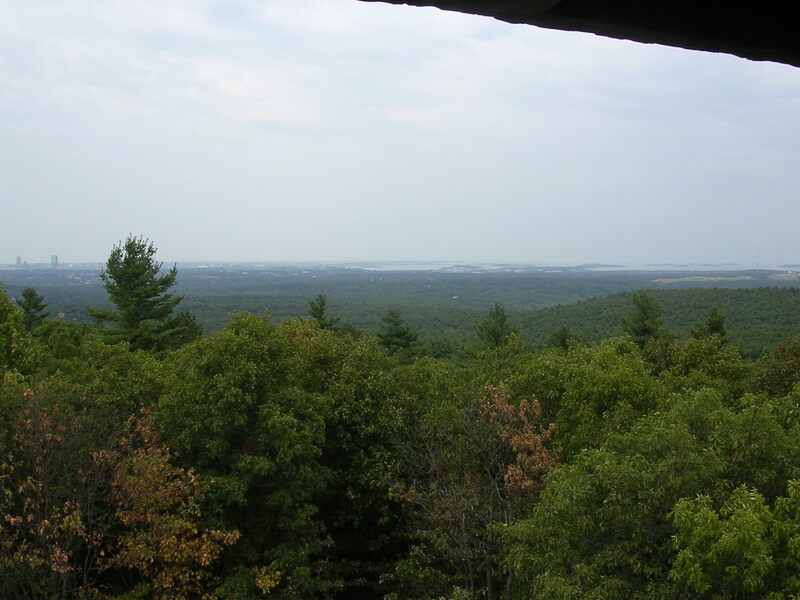 Scenic Views: Great Blue Hill has a observation tower built by the Civilian Conservation Corps as part of the New Deal in the 1930’s (The Eliot Tower). The views of the city and Greater Boston Area on a clear day are amazing and make this a very popular spot for families. Northeast view from the CCC Tower atop Great Blue Hill. Downhill Skiing: Great Blue Hill is home to the ski area closest to Boston and a great place to learn. If you want to do a few turns after work they also have lights and are open well into the night in season. Cross-country skiing: Many of the paths through the park that leave from here are ideal for cross-country skiing. However, getting enough to snow to make it feasible seems to be a pretty rare event. Snowshoeing: Both Great and Little Blue Hill have lots of trails that are great for snowshoeing if there is enough snow (and you’d need a lot on many trails because they’re very rocky), however if there isn’t much snow it might be feasible to snowshoe on the ski trail after they’ve made some snow, however it could be crowded. Trailside Museum: This museum has some exhibits explaining the history and geology of the area and an outdoor area with some local wildlife you can view. Kids love the otters as they swim in their enclosure. Weather Observatory and science programs: The weather observatory at the top of Great Blue Hill has been in continuous operation since 1885 and offers science programs for a fee that are great for kids and schoolgroups. For more information check out their website. Facilities: The Trailside Museum has a small store and facilities there. I’d recommend investing in a trail map, it’s really cheap and lists all of the numbered markers in the park and really helps with navigation. There is also a separate set of bathrooms just a short walk from the museum as well. There is a small fee if you want to see the museum’s exhibits, it’s a great stop if you have children with you. How to get here: The parking lot for the Trailside Museum is located right off Route 138 in Milton. The closest exit is exit 2 off I-93 which brings you straight onto Route 138. Take the ramp to go north and then after you pass a light it will be on your right. The first lot is for the ski area and then there will be a second lot further up. Both lots will work but if it gets crowded there’s more than one lot. You will also pass a lot on your left, that lot is ideal if you want to hike up Little Blue Hill. Swimming: There is a roped off swimming area here. It’s a great place to beat the heat on hot day. Though there are chairs for lifeguards they often aren’t there and the water is usually not guarded. Picnic and Grill Areas: Picnic tables and charcoal grills are available here. Group Areas: There is definitely room for a large group gathering here and I’ve seen several including what appeared to be a tent revival! If you’re interesting in reserving a spot for the day please call the park rangers for more information at (617) 698-1802. 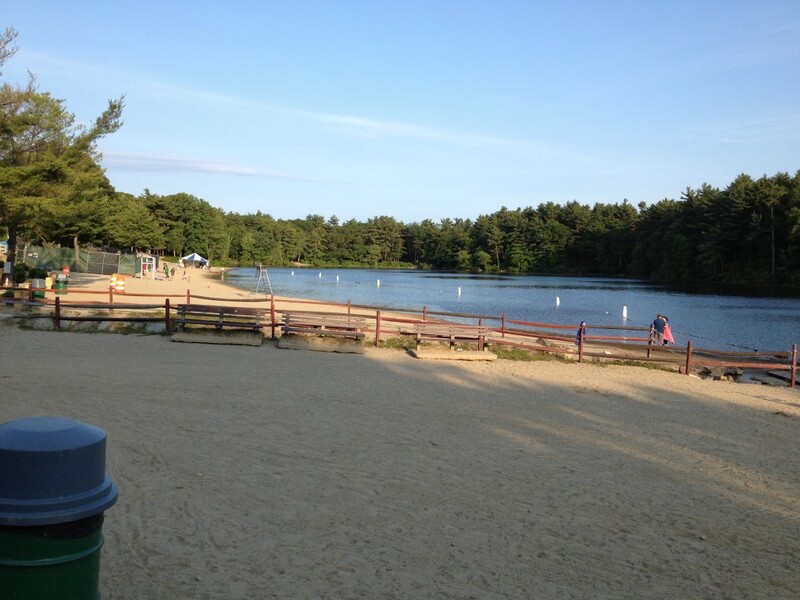 Fishing: Fishing is allowed at Hougton’s Pond with a Massachusetts Fishing license. Mountain Biking: Mountain biking is permitted here, however you stop at the park headquarters to get more information about which trails are open to biking before you go. Tennis Courts and other sports fields: There are tennis courts and sports fields located in this area as well. Hiking: There are a couple hikes that are best accessed from the park headquarters. The Skyline Trail splits into two parallel sections as it runs east to west from the park headquarters to Great Blue Hill. This section is called the Skyline Loop and is a great 2-3 hour loop that you can start here or after hiking up Great Blue Hill from the Trailside Museum. The park headquarters is the most direct access to the loop portion of the trail as the western edge of the loop is the park headquarters. You can also access the Ponkapoag Trail from there as well if you park at the lot at the end of the bridge right as you exit from the highway. Tot Lot/Playground Area: There is a nice playground area that has features appropriate for kids of all ages including my personal favorite; a great set of swings! Favorite Activities: Hougton’s Pond is a convenient swimming area that is very close to the city if you wan to cool off on a hot summer day. That combined with the access to the Skyline loop section of the Skyline Trail makes this a fantastic area to start your exploration of the urban gem. Facilities, Fees and other information: This part of the park has the majority of the facilities that you’ll need as a warm-weather visitor. The Park Headquarters is here (a great place to stop and get information along with purchasing a park map, a great idea if you plan to hike for more than a few minutes) and chat with a ranger if you’re looking for advice on where to go. There is also the swimming area facilities here including a brand new bathhouse that is scheduled to be completed this year (2012). Most of the facilities here are free however if you want to donate to help maintain this wonderful park I’d recommend you visit the Friends of Blue Hills website both to sign up to volunteer and/or make a donation. What to do here: There parking areas on Route 28 are great for accessing trails that are near this road that bisects the park. There are several notable trails here including sections of the Skyline Trail and the Pipeline Trail (which is the path of a natural gas pipeline and has a great trail-side raspberries to munch on if you get there at the right part of the year (mid-August to early September, depending on the weather patterns that year). The Chickatawbut overlook and path up Chickatawbut Hill also provide wonderful views of the area and paths for people with widely different fitness and ambition levels to enjoy. Directions: Take exit 5 off I-93 for Route 28 north. Right after the exit keep an eye out for parking areas off both sides of the road. For the Chickatawbut overlook take your first right after getting onto Route 28 for Chickatawbut Rd and there will be two parking areas on your right: one right after you turn and the other a little further up. Rock Climbing: The Quarries site is fairly popular with rock climbers and a great place to practice, especially when you consider that it’s less than 10 miles south of Boston on the Expressway (I-93). Zip-lining: The City of Quincy just approved the creation of a zip line at the quarries site and, if the process with the Department of Conservation and Recreation continues to move along, they should be able to offer this in the future. Hiking: This is a quieter section of the park if you’re hiking however the paths up Rattlesnake Hill, the Quincy Quarries and the St. Moritz Ponds provide some pretty views. Biking: There are some good paths around here for biking however, as mentioned before, you should get more information from the park headquarters regarding this is open and best suited for biking before you take off. Ice Skating: One of the two rinks in the reservation operated by the Massachusetts DCR is located here (the Shea Rink). For more information please go their website or call them at (617) 512-8402. Camping: The only camping permitted in the park is here, at cabins owned by the Appalachian Mountain Club. For more information go their Ponkapoag Camp page. Boat Launch (non-motorized only): Boats are permitted on Ponkapoag Pond and there is a boat launch here if you want to break out your canoe, kayak or other boat for the day. Fishing: Fishing is permitted here with a valid state license. Golfing: Ponkapoag Golf Course includes an 18 and 9 hole course. For more information; including course details, rates and hours please visit the golf course’s website. Facilties: There are facilities associated with the golf course and boat launch on Ponkapoag Pond. There aren’t any other locations for restrooms or other facilities.